Blue Mountain Hospital is a full service hospital that was originally built in 1949 in Prairie City, Oregon. The hospital was then rebuilt in 1960 in John Day, Oregon. In May of 2001 ground was broken for the 7 million dollar replacement facility that was completed in August 2003. 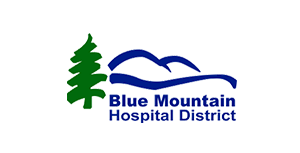 Blue Mountain Hospital has been designated a critical access hospital and is licensed for 25 beds. The Medical Center Clinics are housed within the facility and consist of a Family Practice Rural Health Clinic and a General Surgery Clinic. Blue Mountain Care Center is a 40-bed intermediate care facility located in Prairie City. The Care Center provides several options for senior living in Grant County, including 24-hour nursing care, restorative care with rehabilitative services, respite care and adult day care.